With the craziness of the last few weeks and that darn fall cold that Dylan was kind enough to share with me, my workouts have taken a serious hit. So I’ve been trying to make up for that by improving my eating habits in hopes that those habits will continue once I get back into a good workout routine. One of the things I’ve been trying to do is really up my water intake throughout the day. I do love my coffee and my La Croix, but I’ve been trying to get back to basics and get into a good routine with water. It’s been helpful for keeping my skin clear, minimizing bloating and making me feel better and (possibly) getting rid of this awful fall cold a little quicker. Start early // When I was doing early morning Pure Barre classes, there was one woman who was there every day with her cup of lemon water in hand. She said that’s the way she always starts her day and she felt much better after making that a consistent part of her routine. I’ve been trying to do the same. Lemon water is a natural detox and, once you get used to it, it’s easy to make part of your morning. I try to come downstairs and fix a lemon water before I feed Dylan his breakfast. That means I’ll have it before my coffee and before I eat anything. Make it Easy // It’s weird but I drink a lot more water when I have a straw cup. 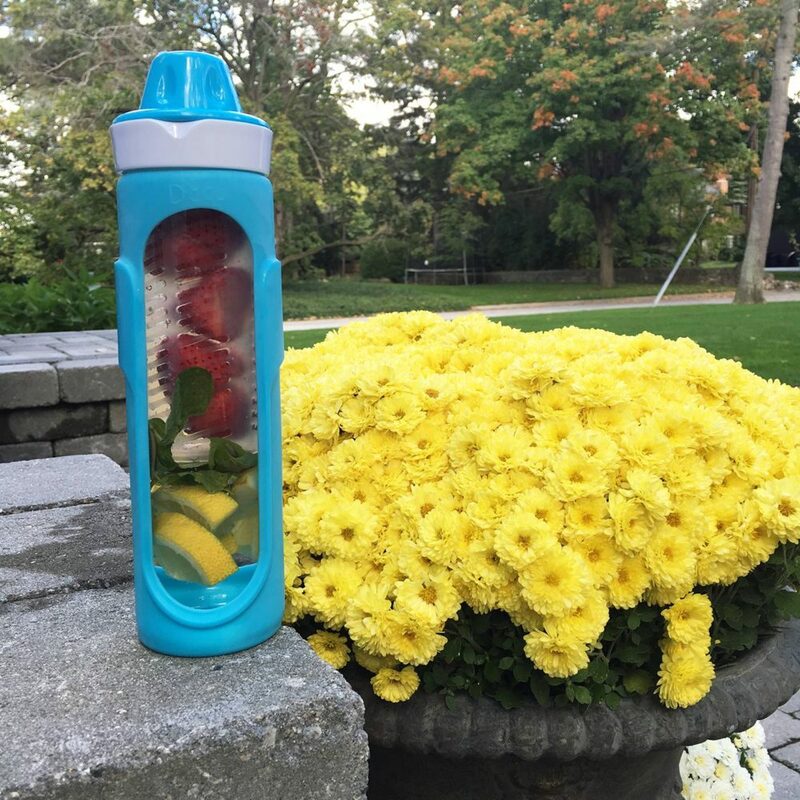 I’ve been toting this D’Eco Fruit Infuser water bottle with me on my errands or just around the house. It helps me make my water more interesting. I also found that I like a cup like this better for my workouts. Plus the fact that it is glass sort of makes it feel fancy! Challenge Yourself // A few months ago I did one of those Facebook water challenge groups where you share how much water you’ve been drinking and sort of motivate each other to meet your goals. At first I thought it was kind of cheesy, but I totally drank more water because I wanted to “win” and show people that I met my water goal! Make it Routine // Along with starting your day with water, plan to have a glass before each meal and before and after your workouts. As with anything, it’s something you have to think about at first, but once you get started and start feeling better, it’ll become a habit and you won’t have to work at it! The cucumber mint sounds amazing! I definitely don’t drink enough water so I really need to start doing this. Thanks for sharing!!! These are such great tips! I always start my morning with lemon water. It’s refreshing and gets me started on the right foot! I need to take these tips to heart! I don’t drink enough water! 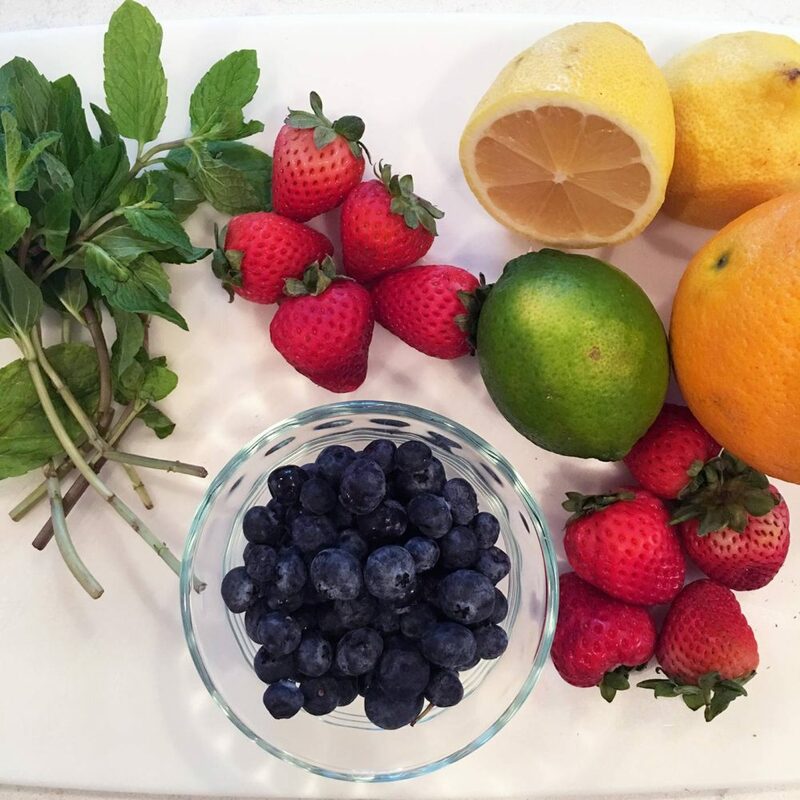 I have a fruit infuser too, and it makes such a difference and makes me want to drink water even more! These are such great tips! I never drink enough water! I am such a water gal & don’t drink anything but (except coffee & wine!). Great tips for getting more H2O in daily! I always struggle to drink more water! This tips are spot on! Starting early is the key for me!!! I drink 90-100 ounces a day. It’s so healthy and such a great routine to get used to, but it’s definitely tough to make it a habit. These are great tips! One thing I always do is carry a water bottle with me all the time. Then I don’t have much of an excuse! I need to add more water!!! I do love basil and mint mixed with fruit!! Thanks for reminding me!!! Great post. Great tips! I’m always trying to drink more water.